Someday I'll Sleep Autism Blogs: Head Covering of the Week.. 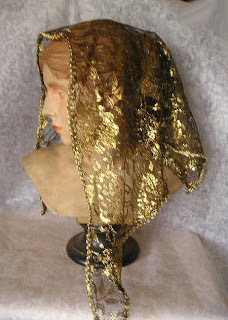 I have a love of gold veils... I don't actually own one, and I think it will probably be quite a while before I do, but as I was wistfully looking at mantilla shops this morning before starting my day I came across a new shop and fell in love with about two dozen of their veils. There are even a few that Sadie would be enamored with (I think she'd go for the bright blue and the pink, although at the moment anyone can tell by looking at her coloring books that green is her absolute favorite color in the entire world!). I was a bit nervous at first because I didn't see prices, until I found this link to their actual store and it turns out that the prices, when compared with a lot of the mantilla and chapel veil shops I've seen, are actually very reasonable (lots of stuff under $20). I think that there will be more Head Coverings of the Week from this site!